Known for its record-breaking snowfalls, plethora of lakes and thriving hipster scene, the Gopher State is home to a rapidly expanding and pioneering gambling and legal real money poker industry. MN is one of the first states to introduce an online lottery gambling system and Minnesota stands a better than average chance of one day expanding its Internet gambling operation to include online poker websites where players can do their real money gambling at Internet poker websites. Unlike Iowa, its neighbor to the south, Minnesota’s betting and gambling authorities have only begun to explore the prospect of regulated gambling and real cash Internet poker. Instead, the majority of Minnesota’s efforts are focused on the increased accessibility of its already successful lottery and its multitude of tribal casinos and live real money poker tables. But make no mistake: The North Star State’s residents are big fans of lawful real cash poker, evident by MN State’s thriving real money poker card rooms offering popular games like Texas Hold’em poker. After all, what better way to escape the cold then to gather around a real cash poker table and let the betting chips fly? Yes, those of you in The North Star state can make a wager on most real money US poker sites. Do you know which ones they are? 2 Can Players From Minnesota Play Online Poker? 3 Is Online Poker Legal In Minnesota? Minnesota’s residents have been able to purchase virtual scratch-offs for real money gambling from the comfort of their home computer since the beginning of 2014, thanks to MN state’s legal Internet betting websites . Minnesota State Lottery Director Ed Van Petten saw the expansion as a means of increasing the lottery’s brand recognition while catering to the state’s younger, Internet savvy gambling demographic. Minnesota state’s gambling and betting critics are vocally opposed to the expansion of real money gambling onto the Internet, stating that it promotes gambling addiction, especially among young adults . To counter potential betting addictions, the Minnesota Lottery has set up stern real cash gambling guidelines, one of which prevents players from wagering more than $50 per week. Residents are also given the option to self-exclude themselves from participating in all legal gambling in MN. Patten denies that the online scratch-offs will increase real money gambling addiction rates, stating: “There have been no reports of increased gambling and betting at all.” He further emphasizes, “We are just offering our legit betting products through the Internet”. Minnesota’s lottery first went online in 2010. Since, online sales only account for approximately one percent of the state’s $560 million annual lottery betting sales. Which raises the question: Would online poker and legal Internet poker revenues in MN also pale in comparison to revenue generated from live real cash poker offerings? Can Players From Minnesota Play Online Poker? Nearly all US-friendly online poker websites, whether we recommend them or not, are amenable to real money players from Minnesota. Back in 2009, state regulators attempted to force ISPs to block online gambling and Internet poker sites, but the measure ultimately ran into legal difficulties and was abandoned. What that means, is that Minnesota’s residents will have no problem scouring the Internet for an online real money poker website. But why search on Google when we already provide you with a list of the best poker websites around? All of our trusted Internet poker websites are known for offering great real cash sign-up bonuses and even better action in games like Texas Hold’em. So if you’d rather stay at home and log on to real money Internet poker in MN than trudge through the snow to the nearest live card room, check out what our regularly updated collection of online poker websites has to offer. Is Online Poker Legal In Minnesota? If we had to sum up the severity of Minnesota’s gambling and poker betting statues in one word it would be moderate. Like most states, Minnesota outlaws all forms of illicit gambling not permissible by law. Yet, the law allows gamblers more versatility when it comes to their gambling and real money poker betting options. Namely, it’s possible that social gambling and real cash poker tournaments could be considered legal under select circumstances. If you have further questions regarding the legality of online poker in Minnesota, please consult a professional. Until then, you can familiarize yourself with the gambling statues most relevant to Internet gaming aficionados, listed below. Unsurprisingly, Minnesota State’s provisions neglect online poker and Internet poker websites entirely. Do note however, that the absence of a law explicitly prohibiting online poker and playing Internet poker for real money does not mean gambling on poker websites is necessarily legal. In fact, there’s reason to believe that placing bets online via Internet poker providers is just as illegal as doing so at an underground real cash poker venue. That said, we are not aware of any Minnesotans being arrested for merely participating in an online gambling Internet poker activity. If you have further questions regarding the legality of online poker and real money betting on poker websites in Minnesota, please consult a professional. Until then, you can familiarize yourself with the gambling and poker betting statues most relevant to Internet gambling aficionados, listed below. (5) except where authorized by statues, possesses a gambling device. In order to accurately assemble a comprehensive definition of gambling, we next look to the definition of a bet. A bet is a bargain whereby the parties mutually agree to a gain or loss by one of the other of specified real money, property or benefit dependent upon chance although the chance is accompanied by some element of skill. Given its nearly universally accepted classification as a hybrid of skill and chance, it appears that real cash Internet poker and live real money poker would fall under the scope of this definition. Sports bookmakers have it even worse. In Minnesota, bookmaking is a felony. Minnesota’s rather elongated gambling and betting statues also define what does not constitute a bet. For instance, bingo, private social bets, skill games, raffles and pari-mutuel wagering on horse races and regulated lottery sales are exempt. This implies that real cash poker home games where no rake is taken nor fee collected are perfectly legal. Social real money Texas Hold’em poker tournaments are legal in so long as the tournament or contest does not provide any direct financial benefit to the promoter or organizer of the gambling event, the value of all prized awarded for each tournament or contest does not exceed $200 in real cash poker winnings, and no person under 18 years of age participates. You can find a link to Minnesota’s full gambling and real cash poker betting statues  in the “References” section. Minnesota’s law enforcement agencies first imposed sweeping anti-gambling and betting laws in 1850, and by 1857 similarly prohibitive laws became a part of the Minnesota Constitution. But that didn’t stop Minnesota’s residents from placing wagers and gambling real money in back alley real cash poker saloons and unauthorized gambling halls. For the next 90-odd years, all forms of gambling including real money poker betting remained illegal. It wouldn’t be until 1945 that Minnesota state officials would legalize bingo – a form of lawful gambling that has remained exceedingly popular in Minnesota to this very day. Around the same time, the state housed thousands of illegal real cash slot machines. But by 1952, most would be purged from existence. It would be over a decade before Minnesota would legalize another form of gambling or legit real money betting. That came in 1962 when private wagering was sanctioned (within set parameters of course). Sixteen years later raffles and pull tabs became legal in MN. But it really wasn’t until the 1980s that gambling and betting began to thrive amongst real money gambling fans in Minnesota, and all it took was the passage of one federal act. The Indian Gaming Regulatory Act of 1988 permitted the state’s tribal factions to operate land-based casinos and live real money poker betting venues. Within several years, 11 tribes were managing expanded bingo halls, some of which eventually evolved into casinos and legal MN poker rooms. In 1985, the state’s first and most notorious racetrack, Canterbury Park , was constructed. Its grand opening came only three years after pari-mutuel wagering was legalized in Minnesota. In 1989, after a long and drawn out struggle, a statewide real money lottery was approved for MN residents to start gambling on. Since then, the lottery has become an enormous source of revenue for Minnesota. By 1999, an updated gambling law allowed the state’s racetracks to upgrade into racinos, opening the door for casino style table games and real money poker gambling in Minnesota. Although Minnesota law does not address online poker, it’s noted that residents can find any number of online poker rooms that will accept them. Pari-mutuel wagering, charitable gaming including real cash poker, the lottery and tribal casinos are all legal in Minnesota. Commercial casinos are not sanctioned, but the state’s racetracks house table games and legit real money poker facilities. Case in point: Canterbury Park features a 33 table, state-of-the-art poker betting room. Over the years, Minnesota has taken a relatively proactive approach to gambling expansion and Internet betting, indicative of the recent changes to its online lottery system. The lottery generates a ton of real cash gambling revenue for Minnesota’s schools, an argument that may be used to initiate further iGaming Internet poker discussions. That said, MN state’s numerous tribal factions may react harshly to a piece of online gambling and lawful poker website legislation. However, they’d likely be more amenable to an online poker and legal real money Internet poker gambling only bill, as it would marginalize the threat to their brick and mortar facilities betting facilities. Preliminary discussions regarding an iGaming Internet poker bill have already begun, although it is currently unknown if and when an actual piece of real money poker website legislature will make its way in front of the Minnesota government. Minnesota is one of the few states to allow players under 21 to play real money poker. Those as young as 18 can try their luck at Canterbury Park – poker betting players get younger and younger! 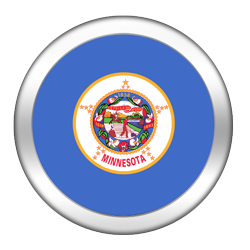 Minnesota is on the fringe of the real cash Internet poker iGaming radar. For now, the state of MN seems content to watch how the infant legit poker websites industry evolves before plotting its next move. With nearly 5.5 million people, Minnesota could certainly support a respectable online poker community of real money Internet poker players. It’s just a matter of whether it’ll choose to take that next step and create legal poker websites in MN, or focus solely on expanding its existing real cash gambling endeavors.